World financial markets woke up to a rude surprise on the morning of Friday, August 10. The U.S. subprime mortgage debacle, which was originally thought to be well-contained within a small segment of the U.S. mortgage market, had spread to Europe. This was the straw that broke the camel's back, especially after several hedge funds from highly reputable investment companies collapsed due to heavy reliance on mortgage-backed securities. 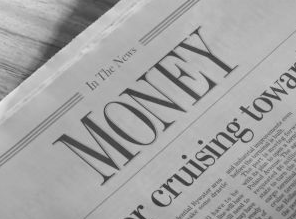 Hearing this news, bondholders and stockholders were quick to sell their risky holdings in exchange for liquidity (also known as money), which is relatively stable in value. Aside from the fact that a sudden spike in selling activity in financial markets reduces the paper wealth of investors, it could quite possibly reduce real wealth. First, let's examine the money market effects of a sudden bond and stock sell-off due to a rise in risk aversion. For simplicity, we'll assume there are only three forms of financial assets: bonds, stocks, and money. The sell-off raises the demand for money from MD1 to MD2, as shown in the diagram below. If the central bank does nothing and fixes the money supply at MS1, the equilibrium interest rate increases from 5.25% to 10%. The economy moves from point A to point B. Second, let's examine the output market effects of a sudden bond and stock sell-off assuming that the central bank keeps the money supply constant. Higher interest rates mean a higher cost of borrowing for households and firms. Since big-ticket items such as automobiles, factories, and machinery are usually debt financed, consumption and investment spending (on physical capital) will decrease. 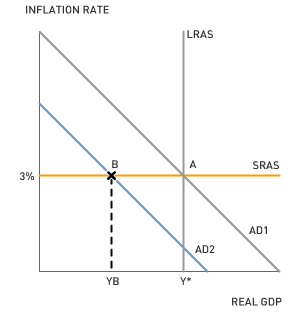 Because consumption and investment spending are the two most important components of aggregate demand, a lack of central bank intervention will lead to a decline in aggregate demand from AD1 to AD2, as shown in the graph below. 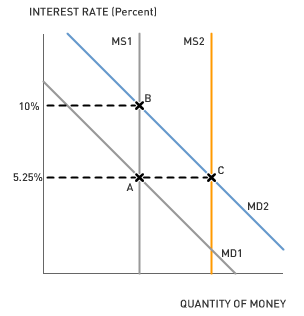 If the central bank does nothing and fixes the money supply at MS1, the equilibrium interest rate increases, which reduces aggregate demand and causes a recession in the short run. The economy moves from point A to point B. Third, let's examine how central banks around the world reacted to the liquidity hoarding. As the New York Times put it, "central banks around the world acted in unison… to calm nervous financial markets by providing an infusion of cash to the system." The Federal Reserve, along with most central banks, believes that fixing the interest rate is a better policy to maintain price stability and full employment. The Fed performed the cash infusion through of a series of government bond purchases known as open-market purchases, which is another term for the purchase of government bonds by the Fed. The cash infusion, or reserve injection, as textbooks call it, shifts the money supply curve from MS1 to MS2. The reserve injection effectively keeps the interest rate constant and avoids a recession. If the reserve injection fails to calm financial markets and investors continue to hoard liquidity while selling bonds and stocks, central banks could inject additional reserves into the banking system through additional open-market purchases. The amount of money the Fed can create through purchasing government bonds is nearly limitless. Read the Federal Reserve's actual press release from Friday, August 10, 2007. 1. For the most part, the Federal Reserve's main concern is first and foremost inflation, and secondarily unemployment. Given these two goals, should the Federal Reserve intervene every time the stock market takes a plunge? 2. Most economists believe that a permanent increase in the money supply will generate inflation and make the prices of everyday goods and services higher than they are today. Is this scenario likely given the large reserve injections in the U.S. and world money markets? Why or why not? 3. Some economists believe that markets are highly efficient in the sense that prices and interest rates adjust immediately to guarantee full employment. If this were true, would the Fed's reserve injections have any effect on credit markets or the economy as a whole? So the Central Bank infused all this money into the economy. What is the future effect of infusing all this money? Can we predict a higher inflation rate? The quantity theory of money is a well-accepted tenet among macro economists. However, MV=PY best describes the economy over the long run, hence we can't say a temporary expansion of the money supply will cause inflation. Here's why, the Fed targets a specific interest rate that it believes is consistent with price stability and full-employment. On Friday, money demand increased tremendously due to spill-over effects in the sub-prime mortgage market. As such, interest rates were increasing beyond the Fed’s target. Hence the Fed injected reserves in order to maintain its target interest rate. If money demand falls after markets are calmed (as the Fed plans), the Fed could quite likely reduce the money supply to its previous levels. Making the price level, unchanged in the long run. And You Think Low Prices Are Always Best? Who Wants to Be a Harvard Grad?